A term commonly applied to any of the different types of European cheeses that are made by traditional cheese making methods and are produced from the raw milk of animals, such as cows, goats, and sheep that are raised on small regional farms, mountain chalet farms, or mountain huts. The quantities of cheese produced from farmhouse methods are small. 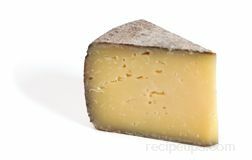 When approved for production by the European AOC (Appellation d'Origine Controlee) the cheese is categorized as a "fermier" or "farmhouse" variety. Although this term was derived in Europe, it is also often used to classify domestic varieties of cheese. Cheeses made with milk collected from a group of farms that are located within close proximity to where the cheese is produced. Typically, the owners of the farms raise their animals on similar grasses, in similar areas, and with similar methods to produce the milk that is used in the production of the cheese. A similar term often associated with European cheeses is "farmhouse cheese," referring to cheeses produced in lower volumes and made on individual farms that are situated in valleys, mountainous areas, or the meadowlands of Europe. Fiore Sardo is an Italian sheep's milk cheese with a light golden yellow color and a hard natural rind. It has a robust, slightly sweet, and salty flavor that makes it a good choice as a snack cheese or for cooking purposes. Fontina is a traditional Italian cheese made from unpasteurized cow's milk. It is processed into a pale straw-colored cheese with a firm, creamy texture and has a slightly nutty and buttery flavor. It is often used as a dessert cheese and as an ingredient in an Italian version of fondue. The best Fontina is produced in the Val d'Aosta region of northwestern Italy; however, the cheese is also produced in other regions and countries, such as Denmark. 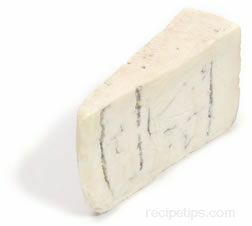 Gorgonzola is a creamy pale yellow cheese with streaks of blue veining. It is made from cow's milk and is named for the town in Italy where it originated. The cheese typically is available as either dolce or naturale. The dolce is aged for a shorter amount of time giving it a sweet flavor, while the naturale is allowed to age for six months or more resulting in a strong, sharp flavor and aroma. Gorgonzola goes well with slices of fruit, such as apples or pears, and it is often crumbled into salads. Gorgonzola Dolce Blue is a cow's milk blue cheese from Italy. It is a milder version of the traditional (naturale) aged Gorgonzola Blue. It is produced from the curd of only one milking and made into various sized wheels that are ready for market at a very early age (unlike other varieties of Gorgonzola). 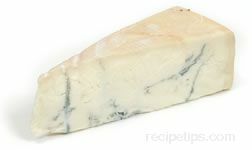 The rind of Gorgonzola Dolce Blue cheese has some streaks of blue mold, but overall, there is very little evidence of the abundant blue and green mold common in many of the aged blue cheeses. It is also much milder and sweeter than other blue cheeses, mainly because it is ready when very young. The Many types of blue cheese are allowed to age for six months or more resulting in a strong, sharp flavor and aroma. 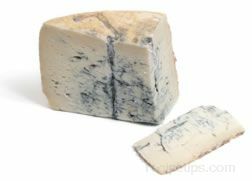 Gorgonzola Dolce Blue is an excellent cheese to serve as an appetizer; as a dessert cheese served with fruit; as a flavoring in salads and pasta dishes; or as stuffing for chicken, veal, or tube pasta. This cheese may also be referred to by a brand name of Dolcelatte. Gorgonzola Naturale Blue is the aged variety of blue cheese made from cow's milk. Native to Italy, Gorgonzola is available as either a mild younger version known as "Dolce" or the stronger aged "Naturale" version. Also made into cheeses referred to as Piccante, Di monte or Stagionato, Gorgonzola Naturale is produced from the curd of two milkings and is produced in various sized wheels. Naturale is typically aged for six months, resulting in a firmer texture and a sharper flavor and aroma than Dolce. Gorgonzola is an excellent cheese to serve as an appetizer; with desserts and fruit; as a flavoring in salads and pasta dishes; or as stuffing for chicken, veal, or tube pasta. 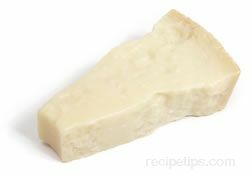 Grana cheese is actually Grana Padano cheese, and Grana is simply an abbreviation of the full name, Grana Padano. This cheese is an Italian semi-fat hard cheese with a finely grained texture. It is pale yellow in color and has a delicate flavor. Produced in a cylindrical shape, it is then cut and sold in wedges. It is made from top quality milk from cows that have been fed and raised under strict guidelines. Grana Padano is a registered trademark name, which is given to cheese that is made in certain geographical regions of Italy. Grana Padano P.D.O. was granted its P.D.O. (Protected Designation of Origin) status by the European Union in 1996. The cheese must be produced under strict regulations, which are certified by the Consorzio. Grana is considered an excellent grating cheese, which makes it a good choice to use with many foods, such as salads and pasta. It is also a good melting cheese when used for cooking. Grana is very similar to Parmigiano-Reggiano, but it is aged for less time and has a more delicate flavor. It is also less expensive than Parmigiano-Reggiano, which is produce only during a specific time of the year. Grana is more readily available because it is produced year-round. When shopping for "Grana" or "Grana Padano" cheese, it may be possible to find cheeses that are branded as "Grana" but have not been certified by the Consorzio as being true Grana Padano cheese. In these cases, the cheeses have been misbranded and are incorrectly labeled. Lagrein is a variety of cheese that comes from the alpine countryside of northeastern Italy. Made from cow's milk, Lagrein Cheese is produced in a region where Lagrein grapes are grown to make Lagrein wine. 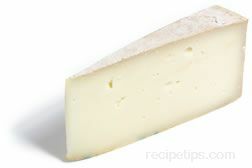 Lagrein Cheese is categorized as a "wine-soaked" type of cheese. 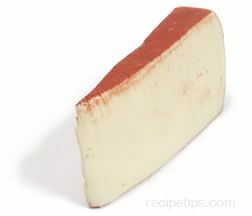 The curd of the cheese is soaked in the red Lagrein wine after which the rind is often rubbed with herbs and spices before the cheese is allowed to age. This procedure creates a firm-textured and somewhat elastic cheese paste with numerous cracks and eyes. Lagrein Cheese is formed into wheels that are typically available in sizes that range from four to five pounds. Mascarpone is an Italian cheese-like product made from the cream skimmed off cow's milk. The cream is then processed to become a spreadable cheese. Mascarpone is basically a solidified cream that has had a culture added to it before being heated, coagulated, and whipped into a silky smooth consistency. Somewhat acidic in flavor, Mascarpone is commonly used to enhance the richness of sauces used for savory dishes. It adds to the richness of pastries and desserts, such as the Italian dessert tiramisu. It is often sweetened and flavored and served as a topping for foods or simply combined with fresh fruit to become a tasty dessert dish. Mascarpone generally has a texture that is similar to crème fraîche, but it can range from very light and creamy to a stiff buttery consistency. The texture can be lightened, if necessary, by adding heavy cream that has been whipped. Montasio is an Italian cheese traditionally produced as a farmhouse or creamery cheese and was originally made from sheep's milk. Today, this cheese is produced from two milkings of cow's milk. The first milking, in the evening, is partially skimmed to remove the cream before being mixed with milk from the morning milking. 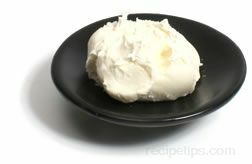 The removed cream becomes mascarpone, a spreadable mixture of cream used to flavor desserts and savory dishes. As a fresh cheese, Montasio is pale yellow with a semi-firm creamy texture and small holes throughout. The flavor is somewhat fruity. When aged, the cheese becomes quite brittle and granular and has a stronger fruity flavor. 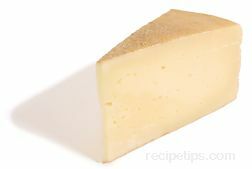 Montasio cheese is a good snacking cheese, or when aged, it is a good grating cheese that can be served atop pasta dishes and other foods. 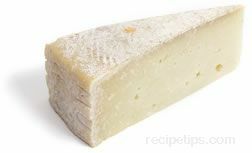 It is very similar to Piave cheese, which is another Italian cheese made from two milkings of cow's milk. Made with either whole or skimmed cow's milk, Monte Veronese is an Italian cheese from the province of Verona. The skimmed milk version of this cheese is referred to as "d'allevo." As a semi-cooked cheese, the rind of this cheese is thin and somewhat rubbery. Inside, the straw-colored cheese has an open texture with numerous small holes. Monte Veronese is produced in small wheel shapes that are aged for several months; but often, the wheels are aged for a year or longer, becoming semi-hard to hard with a sharp, tangy flavor. Monte Veronese cheese is often used as a table cheese or one for grating onto salads and main dishes. Mozzarella is a rindless white creamy Italian cheese that is classified as a pulled-curd or spun-curd cheese. This is because the curds are placed into the whey when it is still very hot and are then removed to be pulled and kneaded into the desired consistency. Mozzarella has a semi-soft to firm texture and a mild flavor. Historically, the cheese was made from the milk of water buffalos and was referred to as Buffalo Cheese, Mozzarella Di Bufala, or smoked as Bufala Provola. Mozzarella made with water buffalo's milk has a sweeter flavor than the Mozzarella made with cow's or goat's milk; however, it is now more common for the cheese to be commercially produced with cow's milk or a mixture of cow's milk and goat's milk. 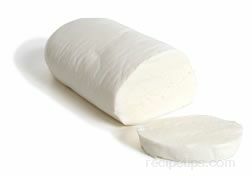 Mozzarella cheese is produced as a semi-soft fresh cheese or as a firm block of cheese made with low-fat or nonfat milk. 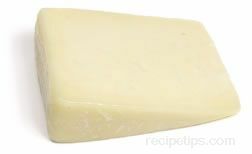 The firm block is most often used to provide texture rather than flavor to food dishes, such as pizza, where the melting properties of the firmer cheese are popular. The firm cheese melts well and enhances the flavors of other ingredients in a recipe (such as pizza). When commercially produced for pizza, the firm cheese is available as a low moisture variety (less than 50 percent) or as a high moisture variety (over 52 percent). When mozzarella is produced as a fresh cheese for food stores, it is available in several common forms. When produced in a block form, it is known as "pizzaiola" or "regular mozzarella" and is sold in squares or rounded slabs. In this form, it is not packaged within whey. It contains a higher level of salt and has the more flavor than other forms of mozzarella. It is also the easiest form to shred. It is most often used for snacking, appetizers, salads, pizzas, and pasta. Other forms of mozzarella are surrounded with brine or whey to preserve the freshness. One such cheese is ciliegini, which is in the form of small cherry-shaped balls. This version has a milder but fresher flavor. It can be eaten as an appetizer or as a complement to salads and fresh foods. When this version is sold as larger cone-shaped drops known as bocconcini, it is packed in brine and is used most often in appetizers and salads. Another form of mozzarella that is similar to bocconcini is a fresh version that is sealed in water to keep it fresh and creamy. It is very soft and pliable, and is used most often to complement salads and fresh food dishes. The stretched curd, sometimes sold as "string cheese" (although it is technically not string cheese), is another form of mozzarella that is similar to the block form in texture, flavor, and salt content. This version is not encased in water. Mozzarella cheese is also available unsmoked, smoked lightly (known as affumicata), or dried and heavily smoked (known as scamorza). Mozzarella affumicata is formed into large balls and smoked over wood chips to become dark brown in color. Mozzarella scamorza has a denser texture and is smoked over pecan nut shells to enhance the flavor and darken the color of the cheese. Despite its somewhat bland taste, mozzarella is favored as a melting cheese that forms an elastic texture desired by many chefs and cheese consumers. The flavor is delicate and slightly sour, with a milk-like freshness. The longer the cheese ages, the softer and more sour it becomes. Fresh mozzarella is best served the day it is purchased, but it can be wrapped in plastic and stored in the refrigerator for several days to retain the flavor and quality of the cheese. If the cheese was in brine initially and is to be stored, place the cheese and the brine in a glass or ceramic bowl, cover the bowl with plastic wrap, and refrigerate it. Before serving, allow the cheese to warm to room temperature. Another way to store mozzarella (if it is not to be used immediately) is to wrap the cheese in plastic and freeze it; then prior to serving, allow it to defrost in the refrigerator before removing it and allowing it to warm to room temperature. Keep in mind that the flavor of cheese decreases after it has been frozen, and it may become moist, which limits its value as an appetizer; but the cheese will still will work well as an ingredient in cooked foods.